The Scooby Doo Haunted House game is a fun way for two to four children to participate in the adventures of fun and crazy Scooby Doo as they move through the scary 3-dimensional haunted house. The game is fun for Scooby Doo fans ages four and older. One of the major television cartoon figures continues to be Scooby Doo. This crazy, loveable character has had his own television series for many years and is now a featured cartoon on the Cartoon Network. He has been recreated several times as a doll and a talking character toy. He is now the central figure in a master toy license with the Pressman Toy Corporation. Be careful to avoid the booby traps! Fans of Scooby Doo can join in his adventures anytime with this 3-dimensional action game for young children. The game board easily unfolds to create a 3-dimensional haunted house with brightly-colored and detailed scenery. Players mark their progress as they move through four levels in the house trying to reach the top. It's not an easy climb through the house, though. Players never know when they will land on one of the seven secret booby traps in or near the haunted house -- like a moving ghost, a creaky staircase and a haunted moose head. 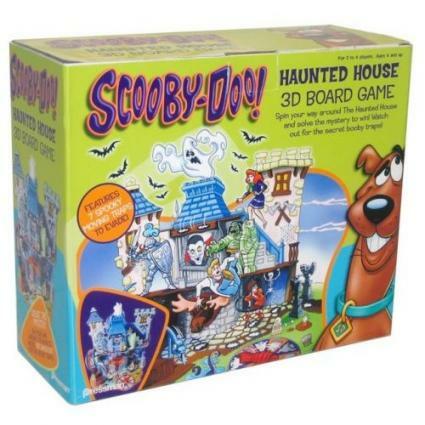 The Scooby Doo Haunted House game is designed to captivate the imagination of a young child. It does not require any reading ability, so it is equally fun for a four year old or a six year old. It is recommended for two to four players. It is an ideal game for non-readers, slow-readers or children who don't speak English. It can be used in a preschool situation to teach young children how to have patience, learn rules, count squares, take turns and play with other children. A typical game might take as long as sixty minutes, so it does require some patience and concentration by the players. Adults might want to consider this game as a birthday gift or as a game to keep at Grandma's along with Candyland and other easy-to-learn games for those times when the younger cousins get together and are looking for something to do. The game does not require batteries, but it does seem to make a growling sound when a player pushes down on the ghost. This is scary fun for little ones! The winner is the first player to reach the top of the roof and remove the ghost disguise from the villain.